Spending up to $300 on an electric guitar isn’t going to change your life, but it actually may improve your guitar playing experience considerably. The reason being that, while guitars in this price range are still a little short of the ‘midrange’ label, they have some features that will really appeal – from upgraded pickups to high-end necks. In this article we are taking a look at some of the best electric guitars that cost less than $300. After the chart we will diving into some of the reasons these affordable guitars prove worthwhile for both beginners and experienced players. Take a trip back in time with this ‘70s-influenced Strat. An affordable eye-catching shred machine. Lightning fast neck means shredding on a budget is possible! Seriously good value from a better-than-basic Strat. An affordable Tele with a bit of bite. A versatile all-rounder from a respected series. Striking style from an affordable metal machine! 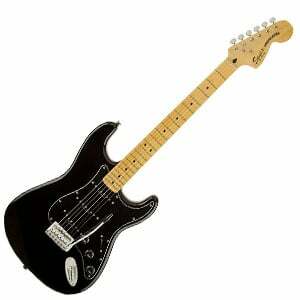 We kick off with a very popular Strat from Fender’s Squier branch – the Vintage Modified 70’s Stratocaster. As the name suggests, this guitar offers a true taste of the vibrant 1970s! It features a classic Strat body shape made from basswood, with a C-shaped maple neck and maple fretboard, all finished with a vintage tint to enhance the retro look of this guitar. The large seventies-style headstock is another nod to this classic era. As we highlight in our in-depth look at the Vintage Modified 70’s Stratocaster, it is loaded with a trio of Duncan-Designed SC-101 single-coils, which are a big improvement on some of the stock pickups you see in this price range. Naturally this leads to an impressive Strat tone! If heavy metal is more your style, it’s hard to think of a better shred monster in this price range than the JS32 Rhoads from Jackson. This iconic guitar shape is real statement of intent for any guitarist! 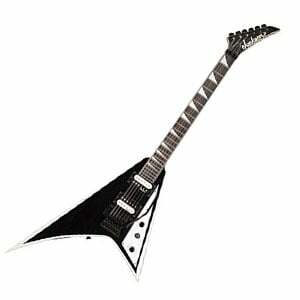 It features the classic arrow-like body made from basswood and the distinctive Jackson headstock. However, the highlight is the bolt-on maple ‘Speed Neck’. Along with 24 jumbo frets and a satin finish, this neck – as the name suggests – is damn fast! The hardware is decent as well, with two pretty powerful Jackson-designed humbuckers, along with a sturdy double-locking tremolo bridge. You can take a closer look in our complete review of the JS32 Rhoads. The good-looking RG421 is the most affordable entry in the Japanese brand’s iconic RG Series and surprisingly features several components found on its higher-end brothers, which we dive into further in the full Ibanez RG421 breakdown. One of these is the excellent Wizard III neck, which remains one of the fastest necks in the industry – in any price category. Paired with a full 24 jumbo frets, the playability is excellent whether you’re a beginner or an experienced shredder. Anything you do shred on this baby is amplified through a pair of Ibanez’s Quantum humbuckers, along with simple controls and a reliable fixed bridge. For under $300, the RG421 offers seriously good value! Looking for a genuine American-made Fender Strat? You won’t find one for under $300 (unless you get very, very lucky at a flea market!). However, when you compare this better-than-basic Strat to some of those in cheaper price ranges, you can easily see the quality it offers. While the pickups aren’t as advanced as the Vintage Modified Strat (above), this guitar still delivers an authentic Strat sound, with bright and sparkly tones – as we mention in the full review of this Standard Strat. The build of this guitar is the highlight though, with a well-finished agathis/basswood body and satin-finished maple neck that feels fast and fun to play. Perfect for beginners, as well as guitar modders. 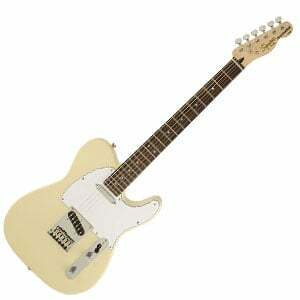 Another Squier to grace this list and this time it’s a Tele. The Standard Telecaster is a simple guitar, but with a few upgrades over the Affinity Teles that make it feel worth the extra cash – as mentioned in the full Standard Tele review. You’ll find a classic Telecaster body shape with a buttery vintage blonde finish, along with all the traditional design points you’d expect – from distinctive Tele headstock to ‘skunk stripe’ on the rear of the neck. It plays very well and sounds good for the price. The two slightly beefier single-coil pickups offer some robustness to the tone, while the sustain is a great thanks to string-through-body bridge construction. The PAC112V is just one part of Yamaha’s excellent Pacifica Series, and well worthy of a place in this chart. With a familiar double-cutaway body shape, it offers a similar style and playing experience to the Strats we have featured, yet a bit more flexibility in tone. This is down to the inclusion of a humbucker at the bridge, along with the single-coils at the middle and neck position. The result is a versatile guitar that performs just as well for modern rock as it does blues, country and jazz. As mentioned in the PAC112V’s main review, the style, playability and craftsmanship is all solid for the affordable price – well worth checking out. Who says beginners have to learn on something conservative? The Custom Zone is another axe from Dean that offers both style and substance, resulting in an electric guitar that beginners actually want to pick up and play. With a curvy and comfortable superstrat body made from mahogany, this guitar is finished in either an eye-popping nuclear green or shocking pink, which covers the body and the neck. This bolt-on neck features a hand-friendly C shape, with a sleek satin finish. As for sound, it’s basic but clear, with two Dean-designed humbuckers offering a punchy tone that’s suitable for everything from your first chords right up to your first metal solos! For more on the Dean Custom Zone, check out our complete review. 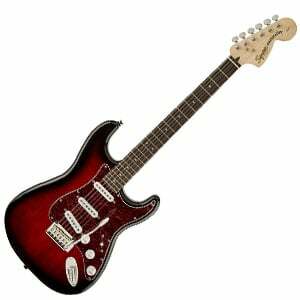 Why Buy an Electric Guitar Under $300? Good question! The $200 to $300 price category is a bit of a tricky one to define. On one hand, you are certainly a step above models on the budget electric guitar market, yet you are still falling short of those in the affordable midrange, which we class as any electric guitars under $500. So, who would shop in this category? As we mentioned, the guitars we have featured – along with many others in this range – are naturally an improvement over entry-level models. While $300 guitars still feature pretty basic hardware and stock pickups, the overall design choice, materials and playability make playing these guitars a much smoother experience. For example, on a model in Ibanez’s entry-level GIO range, you will find the neck is very standard – playable, but certainly nothing special. 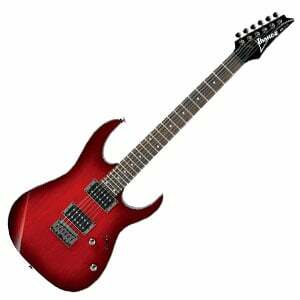 However, as you move up into this $300 price range, you will find the first model in Ibanez’s famed RG Series, which features the same Wizard III neck found on higher-end Ibanez guitars. With this in mind, having such a solid build makes guitars in this sub-$300 price range great for modifying and improving. These guitars tend to have the same basic hardware and electronics as entry-level models, so ripping these out and installing new pickups, controls, nuts, tuners and bridges, can turn a decent guitar into an epic monster that could even rival some high-end guitars. Or you can just enjoy the guitar as it is. Any we have featured on this chart are excellent for practice, jamming and even casual gigging (providing you have a good amp). As with any other category, you should consider where you are buying your guitar from. 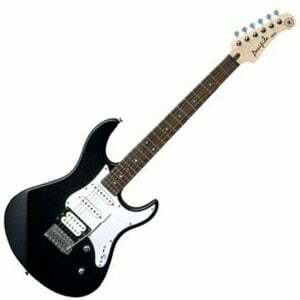 There are two main choices – online or in a guitar store. Both have their pros and cons. A guitar store does allow you to see the guitar up close and even test them out. This is a great advantage, as it allows you to judge whether you really enjoy the feel and tone. Of course, guitar stores are limited by the physical number of guitars they can display at one time, while some won’t be authorized to sell particular makes or models. Buying online offers you a much wider choice and usually at a more affordable price. Delivery is often very fast – sometimes next day! – and the guitars arrive well packaged. Naturally, by buying online you aren’t able to see the guitar up close or try it out, which is a bit of a flaw. This means you have to rely on professional reviews and videos, as well as user reviews, to get a true flavour of the axe in question. Whatever guitar you are considering, shop around for the best deal and then ensure the marketplace or store has a good returns policy, should something go wrong. Should you buy a guitar in this sub-$300 price range? If you are a beginner and can afford it, then you will be presented with some excellent alternatives to what you’d find in the lower ranges – with the added playability and reliability likely to enhance your experience. Advanced players can also find some use with these guitars, taking them as they are or buying them to modify and improve. Whatever your aim, good luck with your new purchase!